Shred Wise Inc. provides secure mobile shredding services to customers in Fountain Valley. Our mobile shredding services include on-site and off-site document destruction as well as one-time and regularly scheduled paper shredding services at cost-effective prices. Since 2006, we’ve served thousands of satisfied clients across Orange County and earned a reputation for offering above-and-beyond service. 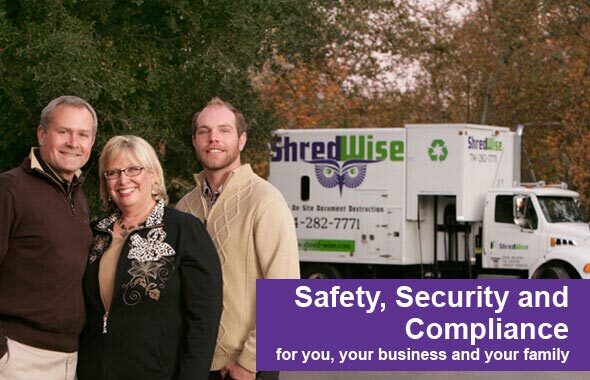 Unlike other shredding companies that have an expansive service area, complicated contracts, and a large staff, Shred Wise is centrally located in Orange County and consists of only four employees. Everyone on our staff understands the role of document destruction in meeting privacy law requirements and protecting our clients from identity theft. They also know how to determine the right shredding program for a wide variety of needs, from the individual looking to clear out their garage to the business owner seeking monthly shredding services to complement their record retention schedule. Because we focus all of our attention on the Orange County area, it’s easy for us to become familiar with our customers by name and to offer flexible service without charging extra. Additionally, as a family-owned and -operated company, we like to keep things simple, fair, and friendly: we provide a straightforward agreement for clients interested in recurring service; we only require 30 days’ notice if you wish to cancel; and we always provide service with a smile. 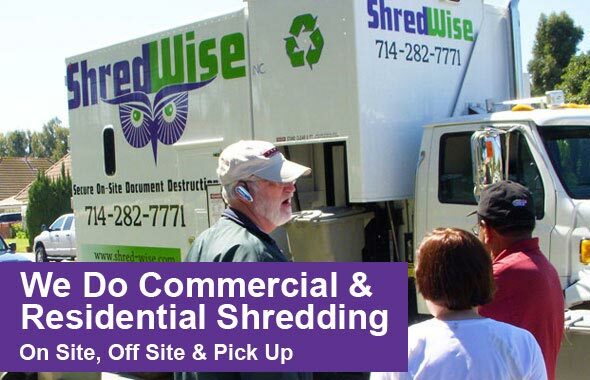 Call Shred Wise Inc. today at (714) 282-7771 if you’d like to learn more, obtain a quote, ask questions about privacy laws, or schedule shredding services in Fountain Valley. We are licensed, bonded, and insured, and NAID (National Association for Information Destruction)-compliant. We are compliant with all privacy laws, including HIPAA, FACTA, and GLBA, and always provide a Certificate of Destruction after we complete a shredding assignment. Shred Wise Inc. is located at 3222 E. Chapman Avenue, Orange, California. Please call or visit us between the hours of 7am and 5:30pm, Monday through Saturday, or between 8am and 12pm on Sundays. Mobile shredding in Fountain Valley is available Monday through Friday. With Shred Wise, you can rest assured that 100% of your paper will be destroyed, and that 100% of your paper will be recycled at a local recycling facility. In addition to paper documents, we are also happy to destroy cds, dvds, and hard drives. We believe that any individual or business in Fountain Valley can benefit from information destruction services. That’s because identity theft can happen to anyone, and today’s privacy laws are so far reaching and come with such hefty fines for noncompliance. The only way to be sure that your private information as well as that of your loved ones, clients, and/or employees is truly secure once discarded is by investing in a qualified paper shredding service. That’s why, at Shred Wise, we offer our comprehensive, customizable shredding services to both residential and commercial clients in Fountain Valley at cost-effective rates. Over the last 8 years, we’ve helped thousands in Orange County, including homeowners, recent graduates, attorneys, CPAs, financial planners, municipalities, school districts, libraries, police and fire departments, escrow companies, mortgage firms, doctors, hospitals, veterinary hospitals, accountants, and more. Fountain Valley businesses seek out our services when they want a paper shredding company that is not only local, but also able to provide competitive rates, reliable service, and flexibility. Shred Wise focuses all its efforts on serving the Orange County area because it gives us the ability to better serve our customers without raising rates, requiring long-term contracts, or incorporating additional charges for things that we consider to be essential to providing good service. As a result, many of our clients have left other mobile shred companies to try our services, and then stay with us for years. Since we offer a month-to-month contract, our clients stay with us because they want to, not because they have to. Not surprisingly, we have numerous glowing testimonials and 1,000s of satisfied customers. If you would like to try out our one-time or ongoing commercial paper shredding services in Fountain Valley, call us today. Estimates are free and can be provided over the phone or in person. When you have Shred Wise handle your paper shredding needs in Fountain Valley, you can sleep well knowing that your sensitive information has been properly destroyed. Shred Wise has more than eight years of experience serving residents of Fountain Valley and routinely come out to help them when they wish to get rid of tax records, contracts, invoices, cancelled checks, bank account information, credit card applications, job applications, payroll records, legal documents, personalized junk mail, and more. Our mobile shredding service saves them time and protects them from the ever-present dangers of identity theft. It can also be surprisingly cost effective; as soon as you collect eight boxes of paper, it is actually cheaper to have us come to you than putting all your boxes in a car or truck and driving them out to a shredding facility. Plus, you can watch the shredding take place right in front of you, receive a Certificate of Destruction, and have your shredded documents diluted with hundreds or thousands of pounds of paper from other clients we visit throughout the day. To learn more about our residential paper shredding services in Fountain Valley, call today. 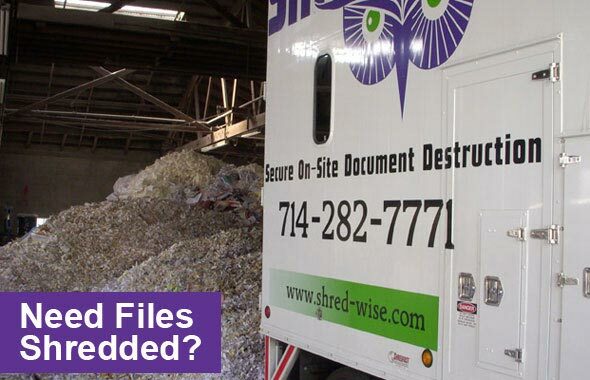 If your business requires regularly scheduled mobile shredding services on a weekly, bi-weekly, monthly or bimonthly basis, call Shred Wise Inc. We are a local shredding company near Fountain Valley with an impeccable reputation for secure and reliable document destruction services. Our on-going shredding services include having a uniformed employee arrive in one of our secure shred trucks and go through your office to move paper from your locked consoles into locked bins. All locked bins are then taken out to our shred truck, where the containers are lifted one by one using an automatic lift system. The paper is then shredded using a pierce and tear method (which shreds paper quickly and effectively while minimizing dust) and mixed with thousands of pounds of destroyed paper inside the truck. You or a designated employee can observe the process with our shred cam or simply have us provide you with a Certificate of Destruction with your invoice. Call today to schedule weekly, bi-weekly monthly, bimonthly, or quarterly shredding services in Fountain Valley. There are no long term contracts, no hidden fees, and no complicated language — just a simple agreement that clarifies the frequency of our service; the use of our locked containers; and the 30 days of advance notice we require to discontinue service. On-site document destruction involves having one of our secure shredding truck drive out to our clients in Fountain Valley, collecting all of their paper stored within locked consoles and bins, loading them curbside, and then immediately shredding them in the truck. Clients need only look out the window or walk outside to witness the destruction process in person, and can even view the paper being shredding using our onboard “shred cam”. Once all of the paper has been destroyed, we issue a Certificate of Destruction, return all locked bins to where they are stored, and transport all shredded paper to a secure recycling facility where the paper is used to make new paper products. With every on-site/mobile shredding job in Fountain Valley, we guarantee that 100% of the paper will be destroyed and recycled. Our on-site shredding service is not only compliant with privacy laws, but also highly affordable and convenient. Call today for a free quote. Whether you have a business that is preparing for its annual records purging process, or you are an individual that needs to declutter your home, give us a call to schedule on-site or off-site shredding services on an as-needed basis. We’ll find a day and time that is convenient for you, and then arrive within that agreed-upon timeframe. For your security, we can provide you with locked shred bins for you to fill, or you can simply bring your boxes of files and paper curbside and we’ll shred your documents right in front of you. For off-site shredding, we arrive with a panel truck, load all your boxes into our truck, and then lock it before transporting them to our facility. Your documents will be shredded according to NAID’s strict document destruction standards and will then be taken to a secure recycling facility. We always provide a Certificate of Destruction once your documents have been destroyed. As with on-site shredding, you are welcome to witness the destruction of your documents. Call today to schedule a one-time purge of your documents and files in Fountain Valley. When your boxes are in a different area for your mobile shred truck to access you might continue off-site document destruction. This service involves sending out a panel truck with a lift gate and lockable rear door to safely transport your boxes or bins of paper from your business or home to our facility in Orange. As soon as we return to our facility, we proceed with shredding your documents and then issue a Certificate of Destruction as soon as everything is destroyed. If you wish, your representative can also witness the destruction of your documents. Call today to learn more or to schedule off-site document destruction services in Fountain Valley.